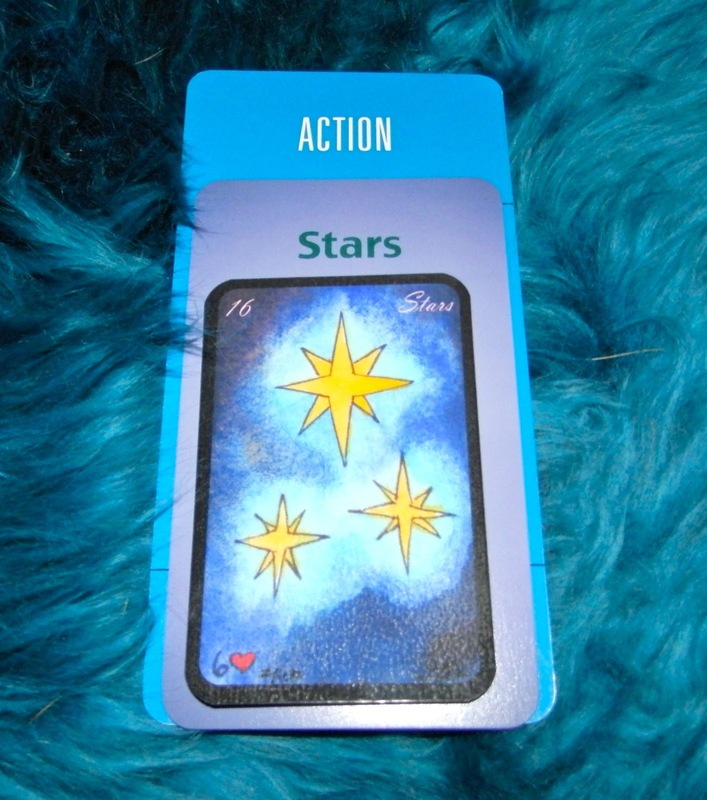 Today's Draw: Stars in the House of Stars in the Action position from Beth Seilonen's Vibrant Night Lenormand and my Deck of Lenormand Houses and Deck of 1000 Spreads. Do you feel a little lost on your path right now? Or is there a new path revealing itself that you're not sure how to navigate? Do you even know where you want to go? Today's draw is a vision in blue, isn't it? Obviously it wasn't planned to have Stars in the House of Stars. It just happened that way. Stars are about guidance and hope, clarity, wishes and inspiration. They can also light a new path. So the way I read Stars in the House of Stars in the position of Action...haha, what a mouthful!...is to just move forward knowing you'll be guided. This is good advice for me personally, because with the imminent release of my new deck (The Deck of 1000 Spreads, in case you somehow missed it ;) ), I'll be entering in a new phase of my life. And it's a phase that brings me some anxiety. See, these days my blog is getting more traffic, my deck is hotly anticipated, people are contacting me for interviews and it's only a matter of time before reviews—both good and bad—of my work will hit the scene. So with each passing day I'm more and more "out there." And for a person that has always done a really good job of hiding away, that's a scary thing. But there are two sides to me, which anyone who knows me personally will tell you. There's the hermit who's just short of having some kind of social phobia, yes. But there's also the chatty, animated teacher, the seemingly extroverted social companion and someone who relishes being the center of attention. The deep-thinking introverted side is the side that writes these blogs, often musing over difficult personal and spiritual insights. And the devil-may-care exhibitionist side is the side that posts them on the World Wide Web for everyone to see—in perpetuity. But most of my days are spent as the introvert. And, to her, this new path full of hope is kind of scary. Stars in the House of Stars in the position of Action says, "move forth confidently, little grasshopper, and the universe will guide you to your destination." Very comforting to remember during times of hyperventilation...haha. And because so many of you are generous in sharing your "new paths" with me, I think this can provide comfort for you, too. There are those who are newly single and those who wish to be newly single. Those becoming a mom again and those leaving momhood for new horizons. And then there are the legions of those who really aren't sure where they're going, but just know they've got to go. There is never a time when God's/Goddess'/The Universe's hand is not gently at our back guiding us forth. And the higher power even gives us a guarantee—that we simply cannot make a mistake along our path...that everything that happens along the way will provide useful information for the path ahead. We often forget that when we're breathing into a paper sack or wandering through life in a fugue state. But it's always there. And today's it's poking us softly on the shoulder to remind us.